First we probably need to identify what we mean by a light wine. For me when I think of looking for one there are four grapes or wines that I consider. When you succeed in finding the right combination of wine, weather, food, companionship and relaxation you are really on a winner. Personally I think that the first thing to do is to look at the occasion and see if you can decide what is best for it. Obviously almost the main consideration is what food you are going to eat. 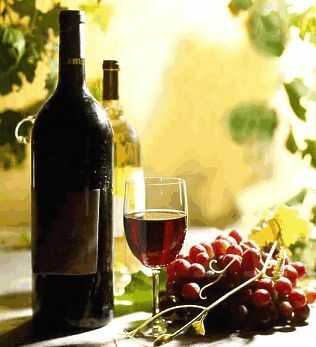 Wine has a way of enhancing food and its flavors. However, it can become a kind of art to get it exactly right. Having said that it also can become a real nuisance to be with someone who will constantly say you can't drink this with that. For instance the group that refuses to drink red wine with fish needs to be avoided. Also there is certainly an element of personal taste and preference. Let's examine the four wines that I consider terrific and in the right circumstances exactly the right light red wine to drink. Surely there is no one who hasn't heard of and probably drunk a Chianti. It is bright and playful and perfect with Italian fare such as pizza, pasta, tomato based foods and lighter meat fare. I am sure you have seen Chianti bottles wrapped in a basket and often used as candle holders. There are Italian restaurants which use empty (!) ones for their primary decoration to make sure you know where you are and what you will be eating and hopefully drinking. Sangiovese is spicy in the form of cinnamon and herbs. Often the fruit of black cherry is also detectable. This wine is modestly priced and really can be enjoyed by every budget. Spain produces this wonderful grape varietal. If you are going to have a night of tapas, figs, manchego cheese and lighter meats like chorizo sausage and paella then here is the perfect accompaniment. The flavor is warm, mellow and smooth. The better ones have a taste of plums or possibly black cherries. The good ones will woo you with an undercurrent of vanilla and mint. Olé. Of course the French can't be left out of any conversation or article about wine. Their famous Beaujolais is usually reasonably priced and often used, rightly so, for the red wine when introducing the beginner to wine consumption. It has berry flavor and it light and fruity. You can often taste raspberries, cherries and/or strawberries. The name Beaujolais has been abused from time to time, so make sure you drink the ones from France because they certainly are the best ones. Pizza, onion soup and such casual foods go down well with it. I have purposefully left the Pinot Noir until last because it is truly the most misunderstood of the light red wines. The Pinot Noir grape is the most difficult grape to grow. They are very delicate and often cause heartache when they don't survive the vagaries of the weather. The bad Pinot Noir wines are watery, flat and simply dull. You will be amazed at the difference when you experience a really good one. Because the bad ones are so available and reasonably priced often people will believe that a Pinot Noir is a bad wine. The best ones are the French Burgundies. I feel I must warn you, the good ones are not cheap. You really are looking at $30 and up for a good French Burgundy. When you have tasted a really good one you will be hooked. It will be cherry like with a touch of rich vanilla. It will feel like velvet on the tongue. The food you will enjoy with the good Pinot Noir can be a wide variety of things like rich fish such as salmon or tuna. Also it is perfect with turkey and a delicate rack of lamb. make sure you have a sufficient quantity. If you get all these things right you will have a wonderful experience and will top the list of entertainers in your neighborhood.